Why should I scan my photos? Anyone can benefit from our scanning services simply as a means to preserve their photos. By converting photos to digital format and backing them up in multiple locations, you can help protect your most precious possessions against loss, aging or damage. Loss, theft, floods, fires and other natural disasters can destroy millions in material belongings. While these can be replaced, memories cannot. Even more exciting is how scanning helps connect families and friends through enhanced sharing possibilities. How will The Digital Convert scanning services keep my family connected? The best part of digital conversion is the enhanced ability to share pictures with friends and family. Instead of constantly running to make reprints of individual prints, you can email a simple link to your photos online. Rather than bringing your original albums on trips or spending time picking out the best family photos, you can take them all with you on a single DVD. Once the job is complete, you can make as many copies of the disc as you like for minimal cost. You don't need to be a computer whiz to start sharing. At The Digital Convert, we do all the work for you! We scan, crop, restore, organize your files and make discs. We can even upload online versions so you can get started sharing immediately! We can also create a beautiful TV-compatible, DVD slideshow for aunts, uncles and grandparents who may not be comfortable with computers. Who should be particularly interested in scanning their photos? Families that are dispersed across the country or globally are excellent candidates for digital conversion. Children often move from home for school, work or marriage and find themselves with little access to family photos and memories. They can't show their children who their relatives are. They can't show their own children pictures from when they grew up. This results in children and grandchildren having little interest or knowledge in family matters. When we scan your photos and albums, you'll be able to make as many CD duplicates as you like. And family will be able to access those photos anytime, anywhere over the Internet as well by uploading them to any of dozens of photo sharing websites. Children that have lost their parents are strongly encouraged to digitize their photos and share them with siblings and relatives. There is no reason to fight over pictures and albums. You can all have a copy in a few days when submitting an order with The Digital Convert. If you inherited family photos and don't have the room for all of them, why not scan and preserve them for future generations? What about divorced couples? Or perhaps those moving fro a large home to a retirement community with less space? Broken families are prime candidates for our service. When a couple gets divorced, all those photos and albums are going to remain in one home. By converting all your family treasures, a father or mother will never need to be divorced from their family memories. They will always be able to cherish those years spent raising their children. There's all sorts of circumstances that would favor digital versions... you might be working abroad on sabbatical, learning abroad, in the army, on vacation or maybe your kids are just away at university. Heck, with a nice warden, maybe you'll be able to enjoy those memories in prison! How cool would it be to always have access to these memories? No matter where you are and how little space you have available, if you've got a smartphone or laptop, you'll always have access to your digital media. What else might we want to scan? Anything you feel family members should know or remember should be digitized. For example, family recipes, family directories, genealogical information, family stories and history, phone numbers, email addresses and children's art (simple, unframed drawings on paper) are excellent items to scan. In addition, documents such as diplomas, school awards, birth certificates may be desirable to preserve. You can choose what items to share and what items to remain private. What do resolution or DPI mean? It is important to understand how scanning resolution, or DPI, affects your digital images. Increasing the scanning resolution, in essence, magnifies the resulting digital image while retaining the original photo quality. What does this mean for you? It means the primary reason for needing higher DPI is to enable larger reprints (i.e. printed enlargements) in the future. Also, if you plan on projecting or otherwise displaying your photos on a big screen, increasing the resolution above 300DPI may be beneficial. What resolution do I need for my photos or slides? Our standard photo scanning resolution is 300DPI. If you require reprints at the original size, 300DPI is ideal. Your photos will also look great on the computer or television. However, if you want the ability to enlarge your photos on paper - especially those old, smaller prints - you will need a higher DPI scan. We can help you decide what's best for you. As an example, suppose you have a 2"x3" photo. If we scan at 300DPI, it'll look great on screen, but you only will be able to safely reprint that photo at its original size. What if you need a 4x6 reprint? Will 400DPI be sufficient? To find out, multiply 400DPI by the width  and height . The resulting digital image measures 800x1200 pixels. Now divide those numbers by the new dimensions (4x6). Since this calculation would result in a printed resolution of 200x200, a higher resolution is necessary for this task. 600 DPI would be the ideal resolution. Now suppose you have a slide with a frame dimension of 1"x1.5". At a mere 300DPI, your resulting scanned image will be 300x450 pixels -- too small to print. Therefore, we increase scanning resolution to 1200DPI. This offers a digital size of 1200x1800 pixels. This will ensure a quality 4x6 reprint at 300x300 pixels. Bump up the resolution to 2000 and you'll be able to make great 8x10 reprints! Higher resolution is definitely available, but unless you need poster size reprints, it is simply unneccessary. Why not just scan everything at the highest resolution? First, higher resolution scanning is slower in order to allow the scanner to obtain greater detail from each photograph. You will be able to make enlargements as from a negative. The cost is slightly higher to compensate for this extra quality and the time required. Quite simply, the digital world was created to mimic the real world. Take, for example, a 20 page (double-sided) photo album at home. You can choose to fill it with well over a hundred 4x6 photos OR a mere forty 8x10 enlargements. The same is true with digital -- and computers in general. Higher resolution photos take up more space on your computer. They can also take longer to load, upload to the Internet or email. Take into account your needs when choosing your resolution. On the other hand, digital storage gets cheaper by the day. We generally have two types of clients. Client A might feel, "I'm doing this now, I'm doing it just this once and I want to do it right the first time." Client B has a little more time and a somewhat smaller budget. He says, "You know, half of these pictures aren't so important and so I'll just bring back any I want done at a better quality at that time." Some of our clients are trying to downsize and may even dispose of their originals. Once you do that, there's nothing to rescan. What is the difference between scanning DPI and megapixels? That's a great question! Digital images are comprised of millions of tiny little color dots, or pixels, that together form a picture. Essentially, scanning DPI tells you how many dots there are in every inch. The more dots, the sharper the image appears. When you scan a 4x6 picture at 300 DPI (dots per inch), the resulting digital image measures 1200x1800 pixels. Multiplying the length and width gives you the full amount of pixels in the image -- in this case 2.16 million pixels, or just over 2 megapixels. While this may sound low compared to the latest digital cameras, with scanners you never have to worry about having proper focus or avoiding reflections. The results are always sharp, in focus and cropped correctly. If you require higher resolution scans, a 600DPI scan of a 4x6 photo will result in nearly a 9MP (2400x3600) image. The amount of pixels, measured in megapixels, will depend on the size of your original print and the DPI used to scan. The different terminology can be confusing, but really refers to the same measurements. What is the process for submitting an order? 1) We accept shipped as well as local orders. For shipped orders, please submit our online order form. You will receive an email confirmation shortly thereafter. Print your email confirmation and place in your box for shipping. We recommend UPS or FedEx for shipping. For local orders, you may stop by any time during walk-in hours. We'll discuss your project, gather your order details and take payment information to be charged upon completion. You won't need to fill out the online form in advance, but if you do, it'll save you some time when dropping it off. Business hours are available on the order page of this website. 2) It would be most appreciated if you can organize your photos into neat stacks. You'll want to remove doubles so as not to get charged twice for the same photos. Also, if you want some photos scanned at 300DPI and some at 600DPI, please keep them in different stacks. Polaroids, thick & fragile items as well as small (wallet size and smaller) should be in separate groups as well. Just keep it organized - that's the golden rule both in print or digital format. 3) Upon completion of the order, your card will be charged based on the final total. If you'd like to pay by another method, let us know and we'll wait for you to stop by. We do require a card on file as some clients delay pickup. If you cannot pickup your photos within 14 days, we reserve the right to deliver your photos at your expense. Please notify us ahead of time if you will not be available to pick up your order promptly. If requested, we can hold them temporarily for a storage fee. No. We understand that you cannot be expected to know exactly how many photos are tucked away in your shoebox. We'll charge your card on file upon order completion once we know the total. For larger orders, we may charge a deposit in advance. If you have a particular budget, we'll make note of it and give you a call with details if it seems your project may go over that figure. Many sets of prints contain doubles. Will I be charged twice? If there's an obvious set or two of doubles, we will take care of it for you at no charge. If there are some random, consecutive doubles in a huge stack or box, we'll probably catch it in the editing stage. The same goes for poorly exposed prints. If doubles are mixed up in the pile though, we cannot guarantee we'll catch it. If a significant amount of doubles are received with minimal organization, we will have to charge a labor fee to get them properly sorted and organized. Will you pay for return shipping? On $50+ orders, we will cover return shipping in the upper 48 states. Coverage is limited to the LESSER of $15 or 10% of the total bill. We will choose the shipping service. Please notify us with any additional shipping requests - (signature required, expedited service, insurance etc). International customers will be responsible for the extra charges beyond domestic. I have a ton of photos and videos. What is your turnaround time? 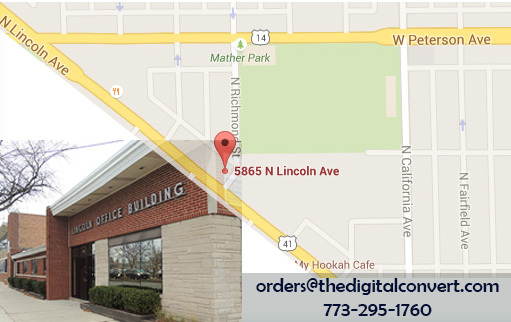 Check out our order form for standard turnaround times. Smaller orders up to 250 photos or up to 5 VHS tapes will typically be around a week though it can be sooner depending on the current backlog. 20 tapes or 1,000 photos will be about 2 weeks. Two weeks is requested for slideshow services. We'll give you an estimated turnaround upon receipt. If you require guaranteed rush service, there would be a rush fee applied. I live in another country. Can I order and pay via PayPal? No problem! We'll send you a PayPal invoice for easy payment. Please be fully aware that you are responsible for all additional shipping-related charges. How do you organize / label photos on the CD/DVD? Photos will be organized as they are received. If a group of photos is clearly marked "Dad Photos", the digital files will be placed in a similarly labeled folder. The filenames themselves will typically be LAST_NAME-FOLDER_ID-RESOLUTION-001...". We can accomodate custom requests, such as editing metadata, filenames or other custom work for an hourly labor charge. I have notes written on the back of my photos. Can these be preserved? We can scan both sides of your photos. There is an additional charge for this service. Do you scan photo albums? What is your process? YES! We offer two options for album scanning: Standard Hi-Speed, and Flatbed. Some album pages are too thick, fragile or show excessive reflection using the standard option. If this is the case, your albums are scanned using a flatbed scanner at a slightly higher rate. This is due to the slower, manual nature of flatbed scanning. Optionally, we can then digitally crop out the images for use in a slideshows, photobooks etc. However, if pictures can easily be removed from the album such as with more modern photo albums, it is generally recommended and cheaper to remove them prior to scanning. If you'd like, we can also remove or replace photos for an hourly labor charge. This will ensure each picture is a unique file with no chance of reflection. In what formats are photos / documents saved? Photos are saved by default in JPG format. This is the most common format and is ideal for general use and e-mail. TIFF is available for those who desire it, but you should realize this format results in very large files. Multiple page documents are scanned directly into a single, searchable PDF file. This service is excellent for old office records, dated statements and childrens' schoolwork that you just don't have the heart to toss away. All scanned materials are organized as labeled. Many other formats, including editable MS Word documents, are available as well. I have over 1,000 photos. Are you going to send a dozen discs? A thousand photos will fit easily on a single DVD. If your project won't fit on a DVD, we can also copy to a portable USB charge (fee applies). A standard DVD has a capacity of 4.7GB, or 4,700mb (i.e. one DVD can potentially hold nearly 5,000 photos depending on the resolution). Is there a way to view my photos or photo albums on the television screen instead of the computer? Absolutely! Digital format allows for endless possibilities. 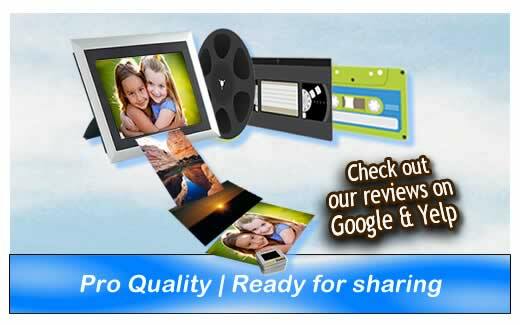 Our premium TV slideshows include background music, smooth motion effects and transitions between photos. In addition, many DVD players can display JPEG images directly from a standard photo disc. You'll definitely want to try out the premium shows, however, as they provide a far superior viewing experience and enhanced control -- including pause, rewind and fast-forward functionality. You can also check out Apple TV, Google Chromecast or a variety of other smart devices that enable interfacing your TV with your personal computer. Can I get my family photos on Facebook, MySpace, Bebo, Geni, CafeMom or my own blog? Your digital images will be ready for uploading to your favorite social network profile. There are several ways to share your pictures - either by uploading the JPG files directly to their website, posting a link in your profile or using a "widget" to display all your photos. Any photo sharing website such as Flickr, Photobucket, DotPhoto, Snapfish, Shutterfly and others will provide a link to your stored photos. How do I protect against corruption or loss of my digital files? The simple answer to this question is SHARE, SHARE, SHARE! The great thing about digital is that you can keep making copies for almost nothing. If you, your siblings, the kids and your parents have copies, you'll have little to worry about when disaster strikes. Duplicate discs are dirt cheap and definitely worth adding to your order. You should want to share the memories in any case. At the same time, it is crucial that you copy all your photos to your computer as soon as you get your disc. Discs can get scratched or lost if not handled properly. So distribute a few copies to relatives, put a copy on your computer or consider using an online backup/sharing service. How do I edit and share my digital images? There are a host of free programs available for digital photo management. One great program is Google's free Picasa. There are built-in editing and slideshow tools - the whole works! If you don't know how to attach photos emails, this intuitive program will have you sharing photos like you never thought possible in a few simple mouse clicks. You'll soon be a true digital convert. Can I search & edit digitized documents? Yes, if you request optical character recognition (OCR) along with your order. Multi-page documents are scanned to a single PDF file. With OCR, You can type a word and find all the instances within a 100 page document. Editable MS Word and many other file formats are available as well.